Sometimes errors occur during DNA replication that alter the sequence by one or a small number of bases by adding too many nucleotides, too few nucleotides, or a wrong nucleotide. The result is called a point mutation. Point mutations can have a negative effect, a positive effect, or no effect on the protein. Most of the time, base substitutions have no effect on the final protein, so they’re called silent mutations. Other times, however, changes in one or a few bases can alter the function of a protein in a negative or positive way by decreasing the function of the expressed protein or improving it. Missense mutations: A missense mutation happens when the wrong nucleotide is added within the coding region of a protein gene and that changes the amino acid that is incorporated into the resulting protein. Nonsense mutations: A nonsense mutation is the result of the wrong nucleotide being added within the coding region of a protein gene, creating a stop codon. The resulting protein will then be shorter than it is supposed to be, or truncated. 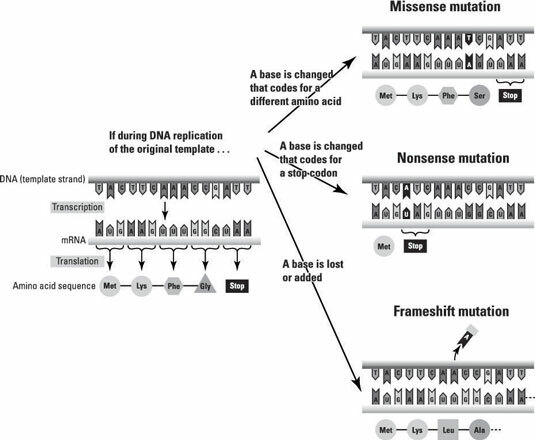 Frameshift mutations: A frameshift mutation is caused by the loss or addition of a nucleotide that changes how the pattern of three nucleotides per codon is read. The result is that, from this point forward, completely different amino acids may be incorporated into the protein. Point mutations can also be caused by mutagens, things like chemicals or radiation that damage DNA. Microorganisms have the ability to repair some of the DNA after damage from a mutagen, the process involves removing the incorrect or damaged bases and adding the correct ones.